Starfy: Prince of Pufftop (known as Starfy, Prince of Pufftop Palace in PAL regions) is an Event Course in Super Mario Maker, released on March 31, 2016. It unlocks the Starfy Mystery Mushroom costume upon completion. 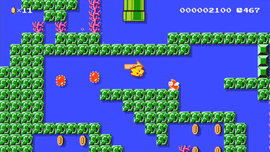 The level begins in an area modeled after Pufftop, with a Flimsy Lift and a warp pipe leading to an underwater location. Mario must travel down and around to enter another warp pipe, leading to a Checkpoint Flag and another warp pipe. Mario must then avoid a Thwomp to hit a P Switch and enter a Warp Door. Mario must continue to the right and around, and hit another P Switch to enter a P Door, which leads to a warp pipe. After passing a few Goombas, the Goal Pole is reached. This page was last edited on November 15, 2018, at 17:02.